Jonathan Newell finds out how the automotive industry is preparing for changes that are taking place in the way vehicles are tested for emissions. In an industry still reeling from the VW emissions scandal and the subsequent demonisation of the diesel engine, the need to demonstrate the environmental cleanliness of its products in a way that is transparent and consistent is of paramount importance. The regulatory framework covering vehicular air pollution has itself come under criticism and so there has been a flurry of activity amongst the regulatory authorities to improve and harmonise standards to introduce a consistent norm over the next few years. These changes in standards are resulting in a set of goal posts that seem to be in almost constant motion between now and the mid-2020s. To understand how the industry can respond in such an environment, I spoke to internal combustion engine testing specialist, MAHLE Powertrain. One of the key things the industry has to demonstrate is that the results it produces relate to Real Driving Emissions (RDE) based on real on-road circumstances rather than a dynamometer. RDE testing underpins the entire transition from the existing New European Driving Cycle (NEDC) regulations to the harmonised World Light Test Procedure (WLTP) which is expected to replace NEDC entirely in the next decade. According to Simon Williams, Leader of RDE Development at MAHLE Powertrain, there is a huge amount of change in the emission regulation requirement over the next 5 years which is creating challenges for the industry. “If we just consider the planned changes to EU emissions regulation for light duty vehicles, we have the inclusion of RDE with EU6d, Temp and WLTP from the 1st September this year. Then we will still be using NEDC for the CO2 and fuel consumption measurement until 2020,” he explained. From 2021, the framework will switch completely to WLTP but even then, the results will be correlated back to an NEDC value using the post processing “CO2mpas” tool. The CO2mpas tool was developed to enable the industry (and consumers) to have a benchmark against which they could compare test results whilst the goal posts are on the move. 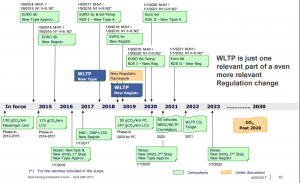 The ability to compare CO2 results between WLTP and NEDC also meant that all the NEDC based targets that were set for the industry didn’t need to be changed to match the WLTP regulation, which is even now still in the draft stage. 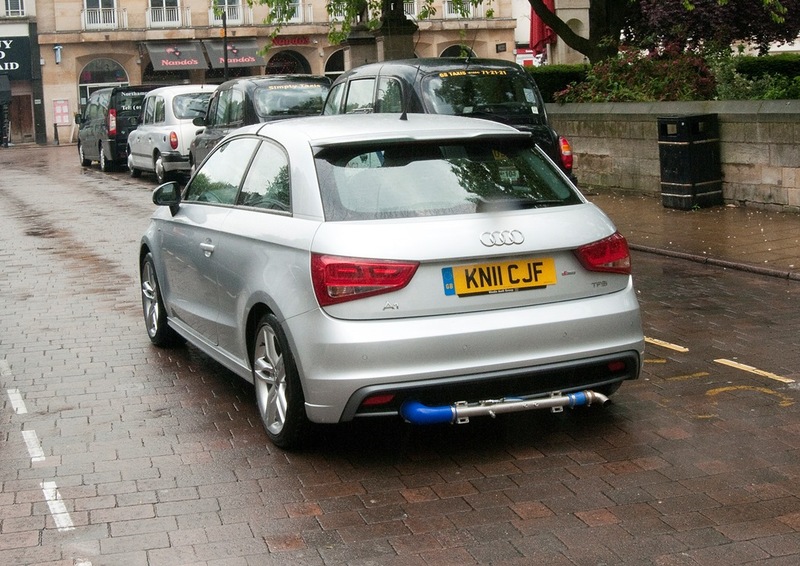 With the new regulations coming into force as soon as this September for new types of vehicles, understanding what needs to be done to test against for real driving emissions is something of a challenge. According to Williams, this is difficult enough when just considering the urban, rural and motorway driving elements, but there is another factor which has taken the industry by surprise – climate. Within the detail of the RDE conditions, a number of new parameters have been set based on external temperature, altitude, speed, driver aggression levels and gradient. “Under the new regime, OEMs will ultimately need to meet RDE emissions targets from -7°C up to 35°C. Similarly, tests will have to be conducted at altitudes of up to 1300m, higher than Mount Snowdon or Scafell Pike. Clearly, replicating such stringent conditions consistently is a challenge that the automotive sector has yet to overcome,” said Williams. To put vehicles through their paces in all conditions required for RDE testing, MAHLE Powertrain has developed its Portable Emissions Measurement System (PEMS), apparatus that fits to a test vehicle to measure emissions in different conditions when it’s on the move. However, the company has also produced RDE cycle simulation technology that enables the tests to be performed on a dynamometer or rolling road. Dyno studies can’t replace the RDE cycle, which by definition needs to be performed in real conditions, but it enables crucial development work to be done to ensure the OEMs get everything right before going through expensive testing of finished products. When asked about the role of dynamometer simulations, Williams explained that in order to guarantee that the company’s powertrains meet the RDE legislative requirements, MAHLE Powertrain has to ensure that all required RDE conditions are met throughout a multi-year powertrain development program. The only way to achieve this is to bring RDE back to the chassis dyno. “Using the chassis dyno, we will be able to prove that the powertrain meets the RDE emissions standards across all RDE boundary conditions, including altitude, temperature, gradient, trip dynamics, fuel type and vehicle mass,” he explained. In order to confirm that the company is not just developing powertrains to meet just one RDE cycle, it simulates multiple RDE cycles from a dataset of over 50,000km of real world data, thus ensuring accurate simulation of real world conditions. I asked why this is important, since this is the role of the RDE test performed using the PEMS equipment. “The key point is that by using the chassis dyno, we will be able to test all these conditions in a shorter duration. We won’t run the risk of failing RDE tests due to on road conditions such as traffic or incur the cost of travelling to altitude or hot or cold climatic conditions. Doing this reduces both the development time and the cost,” he said. Once the powertrain meets RDE requirements on the chassis dyno, on road validation across all RDE conditions will be performed to prove that the vehicle meets the requirements during real world testing. “This process will ensure that the RDE legislation is robustly achieved whilst delivering the powertrain to our customers on time and within budget,” Williams concluded. Similar to many other spheres of engineering, the effort put into simulation and prototyping (both real and virtual), smooths the way to achieving product certification at the final stages of development with reduced risk of failure and subsequent re-engineering work. With something as difficult as varying climatic conditions, it’s hard to imagine any other cost effective way of achieving RDE certification on time and within budget. 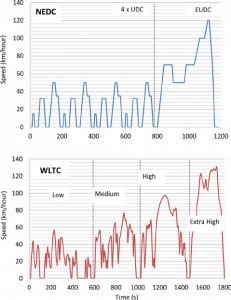 The NEDC and WLTP driving cycles are similar in profile but have key differences in terms of speed, duration and profile regularity as shown in the image. The NEDC consists of the 780 second Urban Driving Cycle (UDC) with an average speed of 18.35kph and four identical repetitions of speeding up and slowing down. It also has an Extra Urban Driving Cycle of 400 seconds with speeds reaching 120kph. The WLTP has four sections representing low, medium, high and extra high speeds. The cycle used for testing depends on the vehicle power but can last up to 1800 seconds in total and reach speeds of over 130kph.